The groundbreaking for a new Smithsonian black history museum took place in D.C. this morning. It will be the first national museum devoted to black life, culture and history, and it will open on the National Mall in 2015. 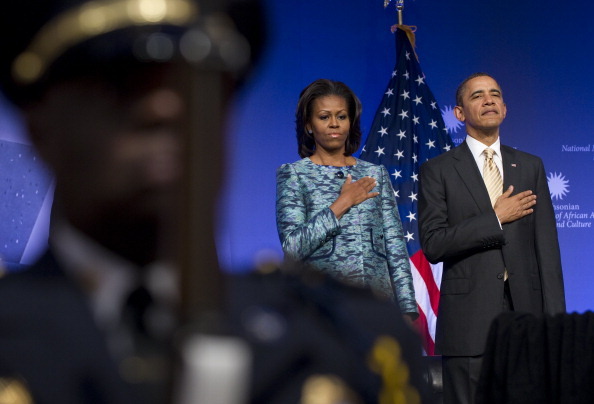 Below is a photo of President Obama with First Lady Michelle Obama at the ceremony, standing during the national anthem, flanked by a solider in the front. President Barack Obama and First Lady Michelle Obama stand for the National Anthem during the groundbreaking ceremony for the Smithsonian National Museum of African American History and Culture on the National Mall. 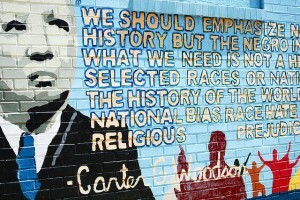 The Carter G. Woodson mural is on 7th Street NW. When: 11:30 a.m. to 3 p.m., Saturday. Where: The National Portrait Gallery’s Kogod Courtyard at 800 F St. NW. Why you should go: Family-friendly and free activities will be held throughout the day to celebrate the start of Black History Month. There will be art workshops, music performances and a photo booth. Other events to consider: The DC Public Library’s annual Black Film Festival begins Tuesday, with films each week focusing on the role of black women in American history and culture. Films screen weekly at 3 p.m., Tuesdays at the Martin Luther King Jr. Memorial Library at 901 G St. NW. 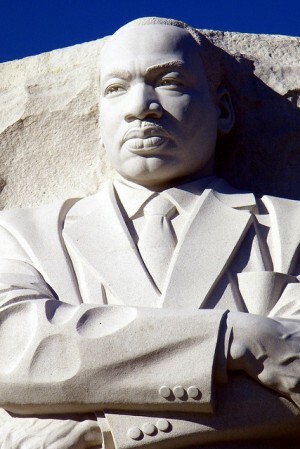 Martin Luther King Jr. Day is on Monday. History: Monday marks Martin Luther King Jr. Day and this year will be the first time that King’s memorial on the National Mall will be open to the public. A number of events and activities, which can be reviewed here, are being held on the memorial’s grounds starting Friday and running through Wednesday. Talk: It’s too late to reserve seats to attend Thursday’s “Remaking America,” a conversation hosted by Tavis Smiley at George Washington University and being broadcast live on C-SPAN. But if you have to miss it, you can check out the official after-event with Smiley and Cornel West at Busboys and Poets. It starts at 10 p.m. at the 14th and V streets NW location. Art: We’ve recommended checking out the Corcoran Gallery of Art and Design’s “30 Americans” exhibit before, which displays heralded art by black American artists. The gallery normally charges $10 for entry, but is offering free admission from 10 a.m. to 5 p.m., Monday. The Corcoran is located at 500 17th St. NW. Courtesy of Rubell Family Collection, Miami. Kehinde Wiley, Sleep, 2008. Oil on canvas, 132 x 300 inches. The ongoing “30 Americans” exhibit that recently opened at the Corcoran Gallery of Art showcases work by some of most important African American artists of the past 30 years. A view from the Reflecting Pool of the 2006 NSO Labor Day Concert. What: National Symphony Orchestra‘s tribute to the legends of D.C. music. When: Gates open at 5 p.m. and the the show starts at 8 p.m., Sunday. Where: West lawn of the U.S. Capitol. The show will be moved to the Kennedy Center if it rains (call 202-416-8114 after 2:30 p.m.). 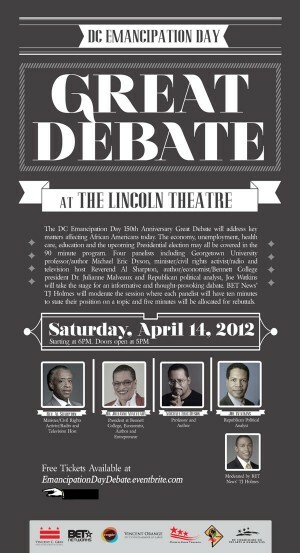 Why you should go: There are two D.C.’s, but both of them will come together for this event. When else can you hear go-go played on the U.S. Capitol lawn, and by our nation’s symphony orchestra no less? 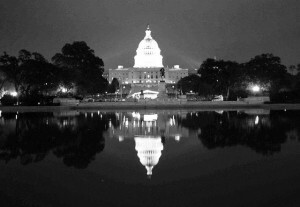 The music of D.C.’s own Duke Ellington, John Philip Sousa and Chuck Brown will be showcased. The show will also be a sort of birthday celebration for Brown, the “Godfather of Go-Go,” who turns 75 this year. Other events to consider: Saturday is the last day to take advantage of Free Summer Saturdays at the Corcoran Gallery of Art at 500 17th St., NW. Admission, which normally costs $10, is free on Saturday. Where: Natural History Museum, Baird Auditorium (10th Street and Constitution Avenue NW). Why you should go: The question “What are you?” is complicated to answer for multiracial Americans. A photographer documented the responses from mixed-race D.C. area residents. 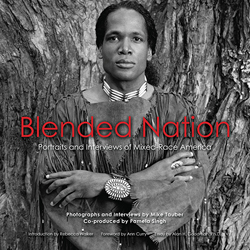 The subjects of the photos will talk about the concept of race and how they self identify. Other events to consider: The event “The Art of Vandalism” will take a closer look at how D.C. graffiti should be handled. The cost is free and it takes place at 6 p.m., Tuesday at Busboys and Poets (1390 V St. NW). Grand opening events for the new African American Civil War Museum take place Saturday through Monday, and they include a film festival and panel discussion. The new museum has seven times more exhibit space than the old building. Ticket prices range for the events held at 1925 Vermont Ave., NW. This month’s installment of Sulu DC features an all-female lineup of Asian-American and Pacific Islander hip-hop artists. 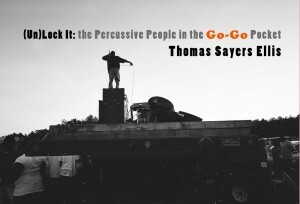 The shows takes place at 7:30 p.m., Saturday at U Street Music Hall (1115 U Street, NW). Advance tickets cost $10 and $15 at the door. 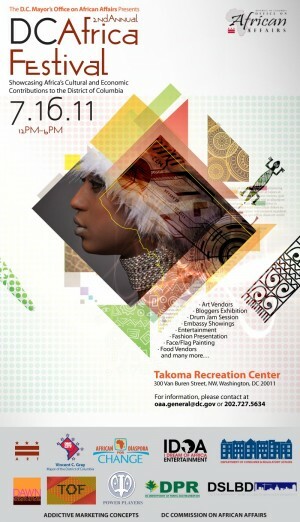 The second annual DC African Festival takes place from noon to 6 p.m., Saturday at the Takoma Recreation Center (300 Van Buren Street, NW). 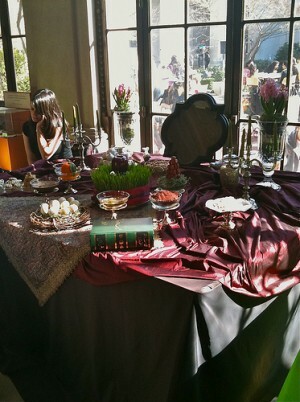 Food vendors, fashion shows, drum circles and a blogger exhibition will all be a part of the city-sponsored event.